Calling all members of the Kiss Army! 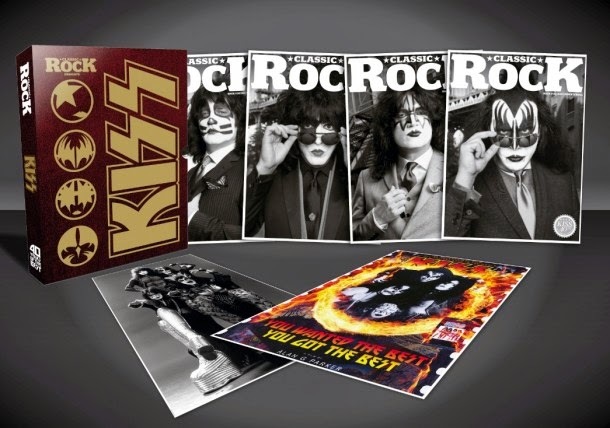 To celebrate 40 years since the debut of the first Kiss album, Classic Rock is releasing a Limited Edition Collector’s Folio containing four exclusive copies of Classic Rock issue No.196. This limited deluxe edition features four issues of the magazine – one for each band member – with an exclusive Danny Clinch solo shot (suited and booted by John Varvatos) on the cover of each. The run is strictly limited to 2,500 copies. As well as the epic 18-page celebration of the band’s 40th anniversary, each of the four issues comes with bespoke bonus content, plus a giant double-sided A1 poster from the forthcoming Kiss film by Alan G. Parker. Each cover will include an exclusive, additional interview with the respective cover star – be it Paul, Gene, Eric or Tommy, the ultimate Kiss Buyer’s Guide and more. As if that wasn’t enough, it’s all housed in a luxurious, foil-embossed hardback slipcase. You can order this special limited edition here. Get ’em while they’re hotter than hell… When they’re gone, they’re gone! Please note, this is a premium product and weighs over 2kg, therefore shipping has been included in the total cost. Only available while stocks last. Please note all packages will be sent in a La Poste package. Shipping will commence from April 9.